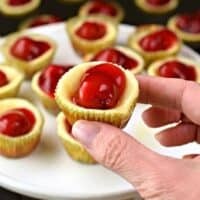 These Mini Cherry Cheesecakes show up at all holidays in our family. Just like a full-size cheesecake, these bite-sized treats are packed with creamy flavor! 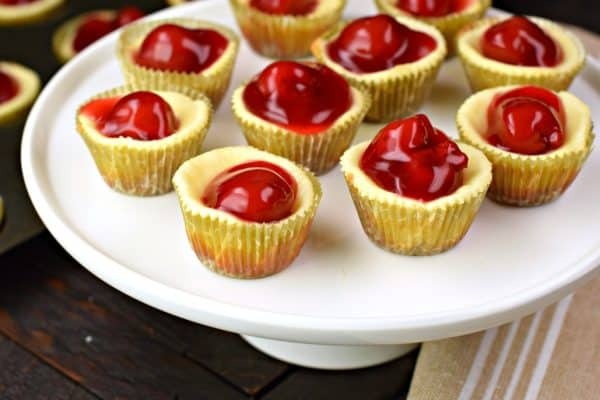 Bite-sized Mini Cherry Cheesecakes. Easy to make, delicious to eat, and makes 4 dozen treats. That’s a lot of bites. Although, trust me when I say how easy it is to just polish off a good 3 or 4 (or 12) of these mini cheesecakes in one sitting. This mini cheesecake recipe is one of my husband’s favorite desserts. I think it may be one of the reasons why he stuck around at my crazy family holiday gatherings (no offense, family). He knew my mom would pull out a big batch of these. At least it gave him something to compliment my mom on food-wise (no offense mom, but we know how picky he is). Funny though. For a man who hates “goopy” and condiments, and cream cheese, and sour cream, and mayonnaise…he LOVES these. 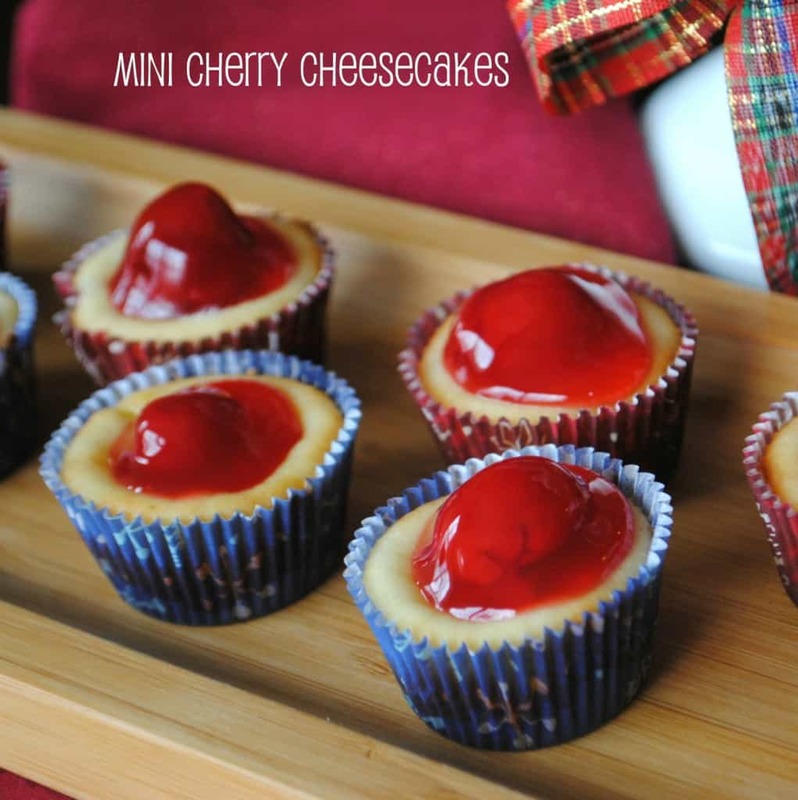 Don’t be intimidated by their petite size – Mini Cherry Cheesecakes aren’t hard to make! You’ll start by making your graham cracker crust. I know some people buy the already made crumbs, but I find that they don’t have a good taste to them. So grab your food processor (or blender) and process your graham crackers to a fine crumb. Add the butter and sugar and mix well. Add about 1-2 tsp of crust to each paper liner. Press firmly. I use a tart shaper for this! For the cheesecake filling, you’ll want to beat your cream cheese for several minutes with the egg, vanilla, and sugar. It will be creamy and fluffy! Add enough filling to each tin to fill 2/3 full. Bake in 350 degree oven for about 17-20 minutes. Remove and cool completely. 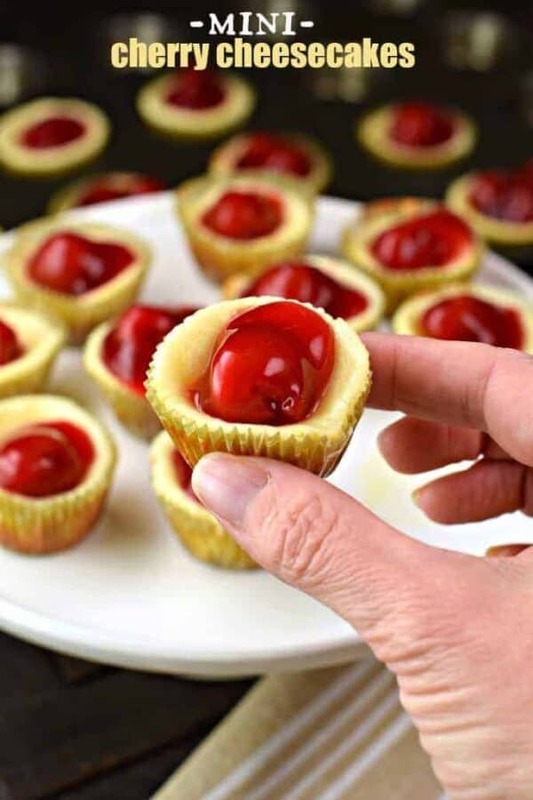 To turn these tiny cheesecakes into Mini Cherry Cheesecakes, top each cheesecake with a dollop of cherry pie filling, making sure that at least one cherry gets on each bite! Refrigerate until ready to enjoy. These are best enjoyed chilled! Still need tips? Check out the video tutorial below! Even though the recipe is easy to make, a few simple tools will make the process of making mini cheesecakes even easier. First, you’ll need a mini cupcake pan with paper liners! We actually have three of these pans so that I can have the next batches ready to go while one is in the oven! I use a tart shaper to press my crust firmly into the pan. This tool is also handy when making Nut Cups. Beating the cream cheese until smooth and creamy takes about 3-5 minutes. It’s easy to do when you have a KitchenAid mixer! It’s no secret that my friends love cheesecake almost as much as I do! If you love my Mini Cherry Cheesecake recipe, you’ll love some of these other cheesecake recipes from my friends and me. Cherry Cheesecake Dip. All the fun of a frosting, topped with cherries…but in a snack form! Go big or go home. This full-size S’mores Cheesecake is so fun…and perfect for a crowd. Cut the slices small as it’s rich and decadent! This easy Pumpkin Cheesecake Bars Recipe makes such an excellent treat to enjoy for any autumnal holiday celebration. Or make year round like I do! Bright, colorful swirls make this Rainbow Cheesecake pretty to look at, and this is my favorite fluffy cheesecake recipe with a hint of lemon- divine! These Mini Cherry Cheesecakes show up at all holidays in our family. Just like a full-size cheesecake, these bite sized treats are packed with creamy flavor! Make graham cracker crust by melting butter and using a fork to mix in the graham crumbs and 1/4 cup sugar. Set aside. Beat 1 cup sugar, eggs, cream cheese and vanilla until well blended. Press 1-2 tsp crust in a paper lined mini muffin pan. Fill 2/3 full with cream cheese filling. Bake in a 350 degree oven for about 17-20 minutes. Makes about 4 dozen mini cherry cheesecakes. Store tightly covered in refrigerator. To serve, top each cheesecake with a tablespoon of cherry pie filling (try to get one cherry on each pie). Enjoy cold! *Nutrition facts are an estimate and not guaranteed to be accurate. Please see a registered dietitian for special diet advice. I love this! These are cute and anything with cheesecake is delicious 🙂 my bf & his family LOVE anything cherry. Aimee, you better believe I’m wearing yoga pants all Christmas break. Bring it on! Although, it’ll only mask the fact I still fit into clothes 😉 but it’s ok, that’s what new years resolutions are for, right? Those look delicious!! I am going to be trying this recipe out! I am your newest follower. I found you at Sweet Bees and Bumblebees. OMG. I died! My boyfriend will LOVE these since he just about licks the walls of the Cheesecake Factory whenever we walk by (read: he isn’t a wall licker; he just likes cheesecake A LOT). Question: do you need to refrigerate these after they’re done baking and cooling like normal cheesecakes do to chill? If so, how long? Thanks! Look at all of you trying to impress boyfriends. Yes ladies, it works, heehee!! @Hayley, yes, put in refrigerator after baking. Top with cherry before serving (I keep the can of cherries in fridge too). looks great! i bet it tastes great too! I would definitely eat 4 or a dozen of these! Perfect way to serve cheesecake at a holiday gathering! Trying to figure out if I use the TraderJoe’s pumpkin cream cheese I bought, with eggs and less sugar… I can impress the heck out of someone this thanksgiving!! LOL! I’m making these for the women’s Christmas party at my church, but I’m making them regular cupcake size. Can’t wait to try I love cherry cheese cake thanks for sharing!!! Anyone know how long to bake if using regular size muffin tin? Do they need to be cooled before add cherry pie filling? These little bites are seriously so addictive and wonderful! 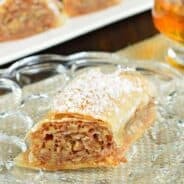 Very easy to make and everyone loves them. Oh I am thinking these will looks so pretty on my Christmas table this holiday! Everyone will love them! I love mini desserts for entertaining where everyone can help themselves! They are so pretty for the holidays and great so I can have a little sweet without an entire slice. These remind me of when I was little….but I would eat the topping and put the cheesecake back on the dessert tray. I don’t do that anymore. LOL! 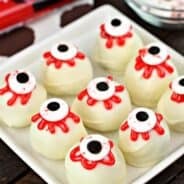 Super easy and totally cute little treats! 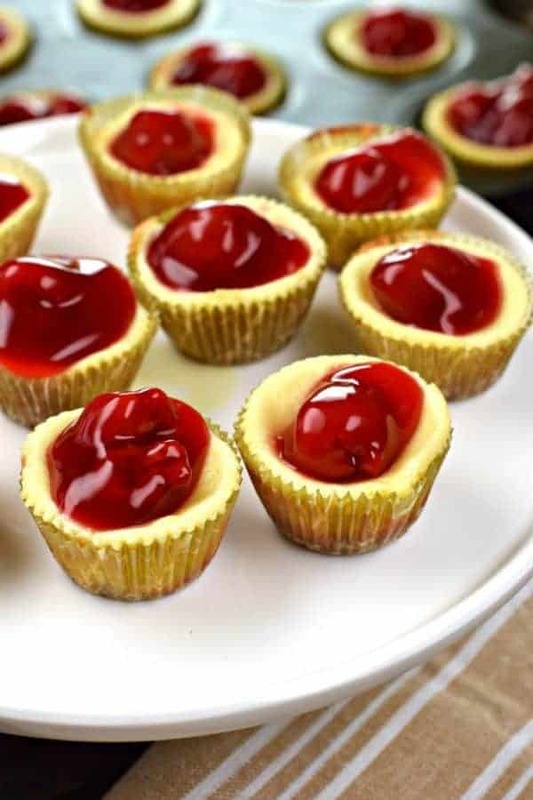 We love these mini cheesecakes! There are perfect for holiday entertaining! So delicious and easy to make. Do not make these. I have been baking for 45 years with a wonderful track record. My daughter who will be visiting for Christmas had one request…mini cherry cheesecakes please. 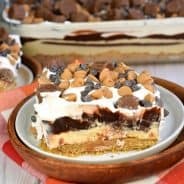 I stumbled upon this blog and decided this would be the recipe I would make. This is by far the worst recipe ever concocted. I ended up with a pile of mush contained by butter drenched tartlet papers that resembled nothing close to cheesecake. More than disappointing. I will not be visiting this blog again. Stick with Betty Crocker! OUCH. My family has been making these for years, as have many readers. Sometimes things happen in the kitchen and maybe you miscounted the number of cups or something? Or maybe your oven isn’t working properly. How long should I bake the cheesecake if I’m using a regular size muffin pan?